The new Freelancer from Raymond Weil stands on the shoulders of the past success of the collection as a whole. However, this timepiece comes set with a new aesthetic character that will launch the collection into the realm of the truly spectacular and functional. The Raymond Weil Freelancer for 2014 is cased in Grade II titanium. This type of titanium is chosen by Raymond Weil for its hypoallergenic nature, and stronger and lighter than steel properties. The case size hasn’t changed from previous models and still remains at 45mm. The ‘T’ shaped pushers for the chronograph function are extended for a sportier look. The main crown is screw locked and uses a textured surface and is also decorated with the ‘RW’ motif. This model is fitted with a brown calfskin leather strap with brown complementary stitching and it is secured with a folding clasp with dual safety pushers made from titanium. This new Raymond Weil Freelancer is made to withstand the equivalent of 100 meters of water pressure. The dial on this stunning timepiece is a metallic grey encircled by a dark grey minute scale and a flange of the same color with a tachometric scale. Tachymeters are designed to offer a reading of average speed when used with the chronograph. 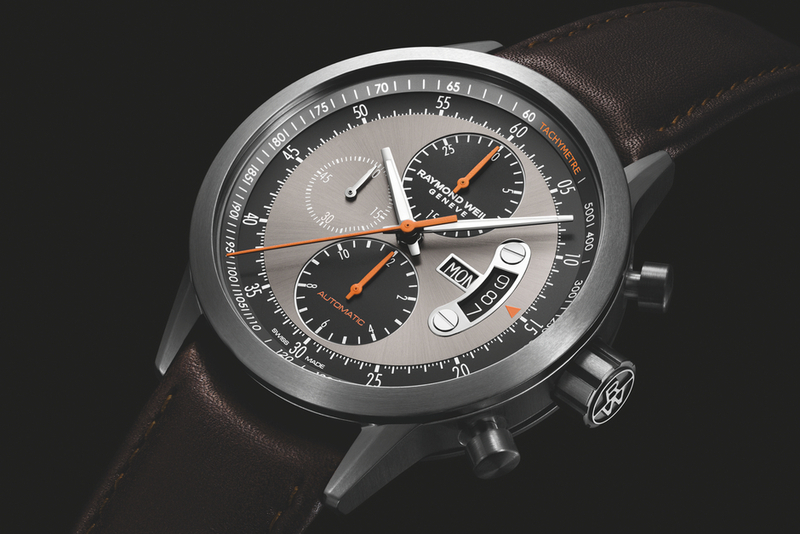 The chronograph counters are differentiated with orange hands with the chrono seconds using a central hand and the counters for the chrono minutes and hours coming in at the 12 and 6 positions. This chronograph can time any event up to 12 hours. At the 9 position is a small seconds register. The stand out complications on this model are the day and date apertures at the 3 position that are encapsulated by a polished metal casing with two polished screws. The main hands are generously coated with lume for legibility at night. Protecting the dial is a scratch resistant sapphire crystal. Powering the new Freelancer from Raymond Weil is a self-winding chronograph movement made in Switzerland. This decorated movement can be seen through the transparent sapphire case back.